Wearables have transitioned from geek to chic as manufacturers experiment with features and functions in fashionable formats. Devices are becoming smarter, with increased functionality and more apps available to support them - look out for the latest stylish smart watches, Apple watches, Fitbits and more at Gitex Shopper. The future looks bright for the industry, which is forecast to be worth $3.6 billion by 2022 in the UAE alone, according to Euromonitor International. AI is the buzzword of the moment, with leading tech companies racing to integrate this latest technology into daily lives. Leading tech companies are investing heavily to bring the benefits of AI to consumers, with products which can learn preferences and habits and smartly adapt to perform a host of tasks. 2017 has seen a leap in AI implemented across the region, from AI robots deployed on Dubai's streets to self-driving cars, giving the region a glimpse into the future. Smartphones are also advancing their AI systems, with personalised assistance like never before, understanding your interests, tastes, emotions and moods. Look out for new AI inclusions in the latest smartphone devices launched during Gitex Shopper. The past few years has seen a merging of the physical and digital worlds through AR and VR. Technological advances in VR headsets have made the systems more accessible than ever before, and consumers increasingly using VR, particularly in gaming and education. Samsung will be displaying the latest VR headsets at Gitex Shopper, including Gear S3, Gear VR, Gear 360 and other accessories. Mobile devices will play a key role in reshaping experiences with the compatibility of AI as a core component in unifying the Internet of Things. As a result, the latest smartphones have larger screens to adapt to this functionality. At this year's Gitex Shopper, Samsung will be displaying its latest S8 and S8+ smartphones. The UAE was recently ranked as number one globally for smartphone penetration, with the industry expected to reach $10.2 billion by 2022. Televisions have been around for nearly a century and are still one of the most popular electronic devices. Recently there has been huge progress in display standards including ultra-high definition (UHD) screens. Leading technology companies are also redefining the design of televisions, such as LG's Wallpaper and Samsung's The Frame, which are cleverly designed to look like stylish wall art. Samsung TV will be displaying its range of picture perfect TVs at Gitex Shopper, including the revolutionary QLED TV. Smart home control systems are bringing automation into the home. The likes of Amazon Echo and Google Home are leading the charge with their range of smart speakers which beyond playing music, can control Internet of Things devices. Controlling lights, the temperature in the home, setting timers and feeding pets can be managed through a central device, making everyday tasks easier. Compare and contrast the extensive range of smart home control systems at Gitex Shopper. Sports, photography and art enthusiasts will see increased benefits this year as digital camera manufacturers partner with offline entertainment providers to provide added value for consumers. This means improved processes to make the production of rich content much easier. Nikon cameras will be on display at Gitex Shopper, showcasing the best DSLR cameras packed with vibrant 4K UHD video support to create cinematic experiences. The gaming industry has changed significantly in recent years, with global launches of Sony PlayStation VR and Pokémon Go bringing augmented reality into the mainstream. Gaming is always a hot topic at Gitex, and this year the event welcomes the arrival of exciting new consoles. Leading the novelty board of products is Nintendo with Switch, a hybrid console that offers gaming at home or on the go and Nintendo 2DS XL, a renewed take on a classic. This year, consumers are cutting the cord and embracing wireless headphones. According to Global Market Insights Inc. the earphones and headphones market will exceed $25bn by 2024. At the forefront of this is a wireless revolution, with the likes of the Apple Air Pod able to wirelessly connect to other Apple devices. Increased functionality has also created extra benefits through noise-cancelling headphones and swimming headphones. 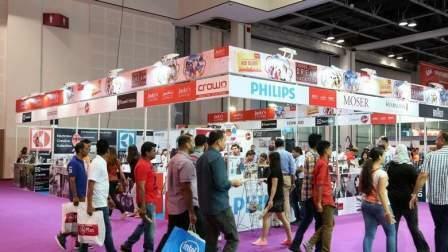 Expect to find a wide selection at Gitex Shopper.